In August, 1963, two weeks before Martin Luther King’s March on Washington,D.C., Frank L. Douglas arrived in the USA. This book recalls the Moments in his life, when the values he learned as a young boy attending Cambridge Academy High School, Queens College, and Elim Evangelical Church, gave him the courage and fortitude to endure and overcome the challenges he faced in a racist society. Those values included: Mercy, Wisdom, Justice, Authenticity, Emotional Strength and Self-Control. The book accounts events at Lehigh and Cornell Universities where Dr. Douglas experienced both negative as well as very supportive actions from the professors. He graduated with Honors from Lehigh University and received his Ph.D. and M.D. degrees from Cornell University. 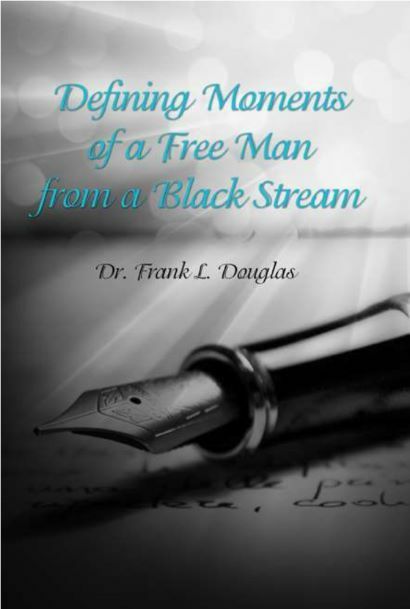 Douglas’ description of his experiences at Cornell University and Xerox Company explain the significance of ‘A Free Man from A Black Stream’ that is contained in the title of his Memoirs. The second half of the book is replete with actual events in which Douglas used innovative approaches to address both personal as well as administrative challenges in the Pharmaceutical Industry, where for many years he was the highest ranked Black scientific leader in top management positions in global pharmaceutical companies. He describes one poignant event in which numerous crosses were placed on the lawns on the Hoechst Campus as the scientists in Frankfurt, Germany, demonstrated against him after he was appointed Head of Global Research at Hoechst Marion Roussel. Finally, Douglas accounts both his excitement and challenges when he returned to academia. He describes his well publicized resignation from MIT in protest to the handling of a racial discrimination case. This resignation was captured by Science Magazine and in Prof. Pamela Newkirk’s Book, entitled: Letters from Black America. Finally, he ends with his experience in building the Austen BioInnovation Institute in Akron as he recounts the challenges of leading an academic, hospital and industry collaboration. An important theme throughout the book is the internal struggle that he waged as he fought to reconcile his religiosity with the realities of the frank hypocrisy of American Christianity and the mean-spiritedness of several American Leaders. Douglas credits his success to his penchant for taking the road less-well traveled and having been blessed with many friends who helped him rise. The book is now available by either calling: 1-800-788-7654 or at: www.dorrancebookstore.com. It will be available on Amazon in 2-3 weeks. American evangelicalism is pro-Israel, and many “Jews” who invaded “Palestine” during the 1940s were white as snow and came from USSR, Germany, France, Batvarian and Hungary. My Jamaican brethren have begun to learn that we (descendants of the so-called Africans) are one of the lost tribes of Israel (not the impostor white colonial settlement). Why would the so-called Africans sell us out?The Israelites and lost tribes have most likely fit the description of the so-called “African” slaves who were sold out by the Africans to Europeans and Khazar-Jewish merchants. Caribbean slaves would be the tribe of Benjamin. We built the pyramids; not some skinny Ashkenazim Khazarian “Jew”. This is a lie. Who was mostly used for slavery because of strength? Those from Africa, (cheap labourers came from Asia, which I acknowledge).